Until recently there is one lone embossed bottle known from this period: the Cullen egg bottle. Recently, a second bottle from this period was discovered. It is embossed Bartlett & Chase and is of the same age as the Cullen bottle. 52. For improved Medicated Liquid Magnesia; Richard Jordan, and Matthew Anderson, city of Philadelphia, June 25. Mr. John Cullen, then of the city of Philadelphia, obtained a patent about sixteen years since, for liquid magnesia, which was formed by rendering magnesia soluble by its combination with carbonic acid, in the ordinary mineral water apparatus. To make the beverage palatable, sugar and rose water were put into the fountain with the magnesia. Jordan, who later relocated to New York, was still selling Cullen's Liquid Magnesia as late as 1838 as documented by an advertisement in the August 31, 1838 edition of the New York Evening Post. It is interesting to note his attention to soda water. The Patentee, encouraged by the success of the patent Liquid Magnesia in Philadelphia and els (sic) where, respectively informs the inhabitants of New York and vicinity, that he has formed an establishment for its sale at No. 235 Broadway, within two doors of Park Place, where he also manufactures Soda Water of a superior quality. BEGS to inform the public, that in consequence of the increase demand for his PATENT LIQUID MAGNESIA, and the request of several of his customers, (for their better accommodation,) he has, in addition to his present establishment, 235 Broadway, taken the store 50 Wall-street, which will be open on Tuesday or Wednesday next, for sale of Patent Liquid Magnesia, Soda Water of a superior quality, Ballston and Saratoga Waters fresh from the Springs. Orders for home consumption and exportation promptly executed. The opinions and recommendations of several of the most respectable Physicians of the Universities of the Sates of New-York and Pennsylvania, as respects the beneficial medicinal qualities of the Patent Liquid magnesia, are submitted to the inspection of the public, and can be seen at either of the above establishments. The study of chemistry was not limited to college students, however. Popular lecturers strove to inform the public........ In 1819, Dr. Russell offered lectures and experiments to the citizens of New Orleans, and the following year John Cullen, M.D., charged participants in Richmond, Virginia, ten dollars each for a series of lectures and demonstrations. Sometime after the summer of 1820, Patrick Cullen left New York and followed his brother to Richmond, Virginia, where he practiced as a physician. Soon after Patrick left New York, an imitator of Cullen's product appeared. The illustrated advertisement appeared in editions of the New York Evening Post from early as June 11, 1821 to as late as February 21, 1822. It does not identify who the actual imposter was, but does list several merchants who perpetuated the fraud. Note that the product is listed as "Cullin" and not "Cullen." Cullen was a member of the first facility of the Medical College in Richmond, where he was the "Professor of Theory and Practice of Medicine," according to the Southern Literary Messenger of 1839. He died in Richmond on December 25, 1849 according to Stryker's American Register and Magazine. Interestingly enough, Gideon's book has period advertisements, appearing only in 1818 newspapers, which mention the embossing on both large and small sized bottles. Gideon also observes that in the following year, 1819, Thomas W. Dyott list "Liquid Magnesia" bottles on his price list and this continues for the next five years. Dyott must have been using molds he acquired from Cullen and likely removed Cullen's name. That makes at least two additional bottles, the large sized Cullen and at least one Dyott version, from this decade that are currently lost to collectors. I strongly suggest getting a copy of Cullen's Egg Bottle by Philo Gideon. The Boston firm of Bartlett & Chase was a contemporary of John Cullen. They too were druggists who also bottled artificial mineral waters. Although the firm was short-lived, lasting four short years, the individual partners were a part of the business community for over 80 years. Thomas Bartlett was born on May 14, 1767 in Boston to John and Tabitha (Kidder) Bartlett according to information in Ancestry.com and the book The Site of Saint Paul's Cathedral, Boston, and Its Neighborhood. At six feet tall and with prematurely white hair, Bartlett possessed an imposing figure and personality. . His appearance greatly impressed Napoleon when they met in about 1803. 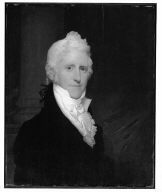 A portrait of him as illustrated was painted by the artist Gilbert Stuart. There is no readily available information about his early years, but we can speculate that at an appropriate age he entered apprenticeship to become a druggist. He was listed as a druggist in 1793, when he joined the Artillery Company, a military group founded in 1637. On February 6, 1794, he married the widow Mrs. Alice Wyer. (nee Fitzpatrick). Alice was seven years Thomas' senior when they married. They had three daughters: Caroline, Maria, and Ann. At some time prior to 1795 he entered into a partnership with Oliver Smith, an established druggist, at 61 Cornhill Street in Boston. Smith had been at this location since at least 1771 according to newspaper and directory records. Bateman's Pectoral Drops; Betton's British Oil; Duffy's Elixir; Dipple's Animal Oil; Godfrey's Cordial; Haarlem Oil; Hemet's Essence of Pearl; Cephalic Snuff; Honey Water; James's Analiptic Pills; Steer's Opodeldoc; Stoughton's Elixir Magnum Stomachicuni; Speediman's Pills, and Turlington's Balsam of Life. Thomas Clement built and hung the sign for $7, and John Johnston painted the Good Samaritan on one side and the passing Levite on the other at a cost of $30. In an interesting side note, the sign was first painted with the Levite passing as described in Luke X. 32 on the opposite side of the Good Samaritan. The Levite closely resembled the Reverend Dr. William Walter, rector of Christ Church, in full canonicals and wearing a wig. The image was so accurate it was immediately recognized by passersby and quickly erased. We have to assume that the artist Johnston took a little artistic license in the portrayal. His motivation, as documented by William Brewers in his 1884 article in the Pharmaceutical Record, was the fact that the Reverend was a Tory during the Revolution and remained unpopular with Bostonians after the war ended. The sign of the Good Samaritan became a landmark of Bartlett's business and was used in his advertising. In 1815 Bartlett's establishment ceased to supply the Dispensary. The Dispensary Board ordered that the sign be removed from its locations on Bartlett's storefront, but Bartlett refused to comply because the sign had become very strongly identified with his establishment.. Soon after, Bartlett paid the Dispensary $50 to retain the rights to the Good Samaritan sign. This old and worn sign still graced the business sixty years later. On September 11, 1800 Thomas' wife Alice died and in this same month Bartlett moved the location of his store from 61 Cornhill across the street to number 13 Cornhill. Two years later on February 4, 1802, he married the widow Mrs. Hannah Willson. (nee Gray). They had one daughter, named Caroline. They offer for sale, at No. 13, Cornhill, (sign of the Good Samaritan) a large and extensive assortment of Genuine DRUGS and MEDICINES, wholesale and retail, on liberal terms for cash or credit. The large stock of Drugs they have on hand, with the arrangements made for extensive importation, will enable them to supply Physicians, Apothecaries, and Country Dealers at fair prices; and those who purchase may rely on receiving none but genuine Articles. T. G. Chase having served his apprenticeship with THOMAS BARTLETT, will give his constant attention to the business. Physicians' Prescriptions, Medicines for family use, &c. &c. will be put up under his immediate inspection; and no article will be delivered except of the very first quality. The delinquent debtors to the late company of BARTLETT & SMITH, are reminded of the necessity of their attention to lessening their demands against them, with all possible dispatch. Liquid Magnesia, or Magnesia Waters. THE salutary effects of Magnesia, as an anti-acid, as a gentle purgative, and as a solvent for Stones and Gravel, have been long known and duly appreciated. There is probably no medicine more extensively in use, and it has long been a desideratum to exhibit it in a state in which it shall retain all the beneficial properties of the common preparations, and at the same timer render it more agreeable to the palate, light and easy for the stomach, and free it from the unpleasant effects which have sometimes been produced by the incautious use, both of the calcined and the lump Magnesia. The very desirable object, has at length been attaned (sic) by the recent discovery, of a clear and colorless solution of Magnesia; which preparation is in the form of a brisk, sparkling Mineral Water, is quite pleasant to the taste, producing all the good effects of the common Magnesia without any thing to apprehend from a free and liberal us of it at all times. The above named Liquid Magnesia is for sale by BARTLETT & CHASE, No. 13, Cornhill, where it can be taken at the fountain; or obtained in quart or pint bottles, securely put up either for family use, or for transportation to a distance. THE copartnership in the Druggist business heretofore existing under the firm of BARTLETT & CHASE, was dissolved by mutual consent the 1st inst. All persons whose notes and accounts have become due, are hereby called on to make payment to THOMAS BARTLETT, no. 13, Cornhill, to whom the whole concern is transferred, and those to whom they are indebted, are requested to call on him and receive their dues. THOMAS G. CHASE purposes to commence an establishment as a COMMISSION MERCHANT, more particularly in Drugs, Glass Wares, &c. of which due notice will be given in a future advertisement. By 1821, Bartlett had taken in a new partner Samuel N. Brewster under the name of Bartlett & Brewster. In 1824 or 1825 Cornhill street became Washington street, and the address of the firm changed to 92 Washington. A Cornhill street was developed at a different location years later. During 1826, Bartlett sold his interest in the drug store to his partner, Samuel, and his two brothers Nathaniel and William A. Brewster. This firm was known as Brewster & Brothers until 1837 when J. F. Stevens and H. W. Cushing entered the partnership and the name of the firm was changed to Brewster, Stevens & Cushing. This partnership dissolved in 1856 and the firm became Samuel N. & William A. Brewster. This firm remained at the 92 Washington street address until 1859. The following year William withdrew from the firm and the location moved to 41 Kilby. A year later it was sold to Thayer, Babson & Co. who remained at this location until 1873 when they moved to 208 State. Then in 1875 they moved again to 167 & 169 Milk Street. In 1886 they opened a second location at 175 Washington. In 1888, Frank B. Thayer took full control of the firm, moved the location to 72 Bedford and concentrated the business on dyestuffs. Thomas Bartlett was a gentleman of the Old School. He was very generally known in our community as a bright example of a virtuous, manly character. With an amiability of disposition and a natural suavity of manners were combined qualities of mind and heart that commanded the respect, as well as the warm regard of all with whom he came in contact. Retiring early from the business of a druggist, with a fortune very moderate, yet enough for his desires, he was known for many years only in the social walks of life. His venerable head and conspicuous white locks have often been the subject of pleasant comment from strangers of a new generation. Thomas Bartlett's partner from September, 1816 to July, 1820 was Thomas Greenleaf Chase, born on March 3 1793 to Thomas and Sarah (Greenleaf) Chase. I found no records as to his early years, but at age 21 he enlisted in Captain William Gates Artillery Company on November 22, 1814 as a Lieutenant at the tail end of the War of 1812. He was honorably discharged in June of the following year. The Military blood ran deep in the Chase family. His father was involved in quelling Shays Rebellion in 1791. His brother, Abel Bartlett Chase, a lieutenant stationed at Fort Mifflin died in an accident there in 1814. A second brother, William Henry Chase, was a graduate of West Point and a Major in the corps of engineers. He built or fortified many forts from Key West to the Mississippi. This brother's sympathy for the Southern way of life and his marrying into a wealthy Louisiana family led to him leading a siege of Fort Pickens in Pensacola, Florida. This happened prior to the bombing of Fort Sumter and is considered the start of hostilities that started the Civil War. A third brother, George Edmund Chase, was a graduate of Harvard University and West Point. He was stationed Florida and achieved the rank of colonel. IN consequence of engagements in Europe, THOMAS G. CHASE informs his friends and correspondents that he has relinquished his business in the Brokerage and Commission line at this place. His brokerage business was taken over by Samuel Barrett as documented in an ad in the same paper. Chase falls off the radar after this ad, but surfaces in Philadelphia in 1824, working at the book and stationery store of Thomas Dobson & Sons at the "stone house" 41 South Second Street (post 1857 45 S 2nd) just above Chestnut. The following year, he is working at the Franklin Circulating Library at 48 South Third Street. Later that same year, Chase was listed as the agent for the South Boston Flint Glass Works at the same 48 South Third Street address as advertised in the November 29th, 1825 edition of the National Gazette. From Linda Warrum's article titled "The Chase for Clorion" in the June 2013 issue of the Indiana Magazine of History and some personal correspondence, we learn some interesting facts about the next phase of Chase's life. He married a Martha on June 24, 1824. Her maiden name and the location of the marriage are not currently known. There were no Philadelphia directories published in 1826 or 1827 and by the time the 1828 Directory went to press, the Chases had left Philadelphia for New Harmony, Indiana. New Harmony was a Utopian society on the banks of the Wabash River. The first incarnation of New Harmony was a Lutheran Separatist community founded in 1814. Robert Owen purchased the town in 1825 and wanted to create a "new moral world." In 1826, he attracted a large number of leading scientists and educator to settle the town. Thomas and Martha came to New Harmony in the latter part of 1827 and brought with them a large "library of 2,000 volumes." With Thomas being a trained druggist, librarian, and having a practical knowledge of chemistry and Martha being an accomplished artist and musician, they were both quickly accepted into the society and taught at the local school. But, life was not so harmonious for the couple in New Harmony. Martha, became involved with some of the local society members and Thomas left her and returned to Philadelphia in May of 1829. In 1831, Thomas, from Philadelphia, engaged a local Indiana attorney to represent him in the divorce, which was granted in 1832. Martha, twenty-four days after the divorce was granted, married Richard Owen, the youngest son of the society's founder Robert Owen. She died in 1834 or 1835. By 1832, Chase was the proprietor of the Minerva Library, a library, book and music store, at 122 Walnut Street. An interesting note is that he was the agent for the Balsam of Lungwort, in addition to being a bookseller. For some reason, booksellers often sold patent medicines in addition to books at their stores. By 1839, Chase had moved his enterprise next door to 120 Walnut, listed as a library, book and music store, an enterprise he maintained until 1844 when he sold the business to William W. Walker. Chase married Harriet Clara Dodge on Feb 19, 1840 in Philadelphia. She was 25 years his younger when they married and five children were born over the next 14 years; Clara Anne (1840), Thomas (1843), Alleyne (1849), George Emanuel (1852), and Emmeline (1854). At this point, Chase drops out of the directories for four years, but returns in 1848 as a Medical Doctor at 244 Spring Garden Street. Likely he was attending medical school and apprenticing during the hiatus. You have to keep in mind that Chase was 55 years old at the time! During 1850, he opened a spice and drug store in conjunction with his medical practice. During 1851 and until 1853, two stores were operated at 97 and 137 Spring Garden. During 1853, Chase refocused on being a medical doctor; first at 137 Spring Garden and then at various location on Green, Vine, Cherry, and Mount Vernon Streets. During these years, Chase appears to have cultivated an interest in chemistry. He received a Patent 22,015 on November 9, 1858 for an improvement in rendering paper and other fabrics in-corrodible and in 1862 he is listed as selling "patent lime." During 1865 and 1866, Chase returned to his roots and operated a music store at 223 South 8th Street. In 1867, he organized a chemical business at the South Eight Street address under the name of T. G. Chase & Company. His partners were I. Addison Bush, the husband of his daughter Clara, and Daniel W. Bush. A price list, in the collection of the Library Company of Philadelphia, states they manufactured extra refined amber mucilage, black, blue, red and carmine inks, machine copying ink, writing fluid, and ladies' violet ink. The firm became Chase and Bush during 1868, when Daniel Bush left the firm, and they relocated to 201 Duponceau Street. I. Addison Bush was sole proprietor in 1872. Ink and mucilage was the firm's mainstay. The company became the Continental Manufacturing Company in 1876 and was in business until at least 1922. They displayed at the Centennial and several embossed and labeled bottles are known. Lt. Thomas Greenleaf Chase M. D. died on March 2, 1871 in Philadelphia just a day short of his 78th birthday. The Bartlett & Chase bottle has a somewhat narrow date that nearly matches the Cullen bottle in age almost exactly. These bottles were likely blown in the later part of 1818, whereas the Cullen bottles were likely blown in the beginning of the year. Also like the Cullen bottle, the Liquid Magnesia was advertised in both pint and quart sized bottles. No marked quart sized bottles are known. It is interesting that this bottle bears a blowpipe pontil and could be of New England manufacture. The illustrated pint sized bottle is currently unique with one know bottle found in Hawaii. There were a number of early artificial mineral and soda water manufactures that started commercial enterprises starting about 1807. There was a rush to establish soda water fountains in Philadelphia, New York and Baltimore. Almost immediately, there was desire to bottle these waters for sale to the public. The early adopters could not find suitable stone nor glass bottles for this purpose. The stone bottles leaked and the glass bottles were too fragile and broke. Used English bottles were utilized for bottling when they were available. A future article is planned in the formative years of the soda water industry in the United States that will delve into the early manufacturers. But it was noted that the Philadelphia manufactures were bottling using glass bottles. Thomas W. Dyott lists seltzer bottles in his inventory of bottles and McKearin notes that seltzer bottles were being sold in 1812 by the old Kensington Glass Works. Over the years I have seen a few early odd shaped bottles from the second decade of the Nineteenth Century. These bottles all had a similar shape and were differentiated by very heavy glass and a strong lip. The bottle shown is typical of these and was manufactured in a dip mold and bears a solid bar pontil. Both these features are indicative of early manufacture. This specific bottle was found in context with black glass bottles that dated from the period 1800-1815.